House of Flesh employs one of my favorite pulp noir themes - a man obsessed with a rotten but irresistible woman. It concerns Harry, a professional basketball player who decides to spend the off-season in rural New England to rest his mind and recover from an injury. He stays in the guest house of retired lawyer Conrad Hickey, who entertains himself by painting nudes. Gale’s bathing suit only approximated one. It consisted of a skimpy white cloth wound about her loins like an undersized diaper and a narrower strip partially across her magnificent breasts. It was the kind of thing worn by the more daring on the beaches of the French Riviera, but it was hardly the sort of attire for a creek in a small and highly conventional village. North Set wasn’t a tourist place where natives got used to that sort of thing. So they stared—the older women scandalized, the younger women envious, the men of all ages enraptured. Not sure a diaper, even if diminutive, is the best descriptor for a beautiful woman’s skimpy swimsuit. Anyway, Gale leaves a dog in Harry’s care and this leads him to the house of Lela Doane and her husband Kenneth, who is the local veterinarian. Harry quickly finds himself entranced by Lela, even though he can’t quite understand why. It’s also hard for the reader to understand why because Lela is portrayed as a rather plain woman of average appearance and flat affect. This is one of my minor quibbles with the novel. Gale is an interesting and attractive bad girl, Lela not so much. As Harry maneuvers to find out more about Lela he learns of terrible rumors surrounding her husband Kenneth and the disappearance of his first wife. The Doanes’ austere and isolated home, which is guarded by fierce dogs, only fuels the rumors. As is often the case in this type of a pulp tale Harry also is involved with a sweet, pure and perfect local girl, Polly Wellman. Of course, he just can’t bring himself to be content with Polly when the mysterious Lela beckons. As also is common, Lela is imbued with an almost supernatural presence. Her seduction of Harry is ritualistic. When she finally captures Harry and they fall into rapture, her plainness and flat personality are replaced by an unearthly beauty and animal intensity. Like all great femmes fatales she is an evil angel, a succubus. As Harry gets pulled further into a strange obsession with Lela, he also gets pulled further into investigating the rumors surrounding the Doanes. 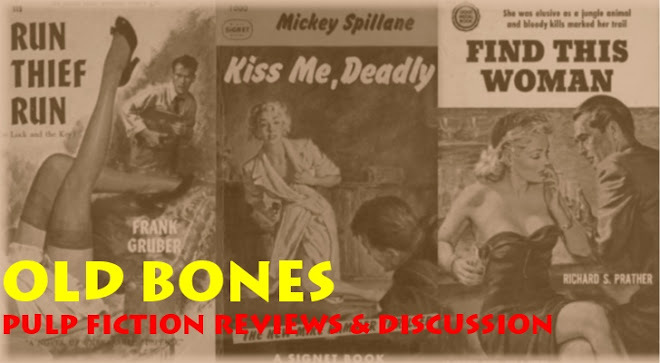 Some human remains are found, Kenneth discovers Harry and Lela’s affair and mayhem ensues. My other minor quibble with the novel is that near the end Harry makes some assumptions that are too stupid to be believable. Consequently, portions of the ending felt contrived. 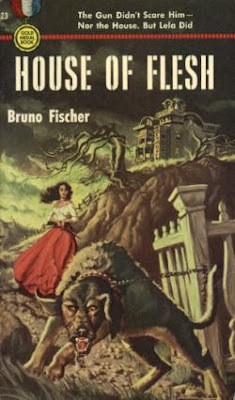 House of Flesh may be read online here. Fischer did this kind of thing about as well as anybody. Great cover, too, a lot like the ones on the gothics that would come along later, minus the dog. It sure looks like you should be joining us on Friday's Forgotten Books. Would you like to post one of these on my blog next Friday? I read this one a long time ago, so long that I forgot what it was all about. I remember that I liked it. At one time I was really cooking through Fischer's novels. He had some good ones. I guess my favorite is "Fools Walked In." (Which I remember reading when I was on jury duty) But there are plenty of others that are excellent. And to be honest, the very first Gold Medal paperback that I read was "The Fast Buck." After that I started grabbing any GM book that I could find.